To have your email marketing reflect your personality and brand, you need to have a template designed just for you. Some services, such as AWeber, have pre-designed templates. These templates are gorgeous but how many other people are using them? It is best to have one that is unique, with your branding, colours and recognizably from you. Here is how to get the perfect ezine template. Recently, I designed an ezine template for a client, Florence Grunfelder of Money with Flo, and she loved it immediately. With only a couple of minor revisions, it is ready to use for her weekly messages. I asked Flo for a couple of ezine examples that she likes from other businesses. I also asked her to explain why she likes them and what, if anything, she doesn’t like about them. Florence also sent me a wish list of what she would like in her ezine. I looked at her website and knew her personality from talking with her. I also looked at some of her previous ezines plus her social media sites. From this information, I knew she liked a clean look with minimal distractions, I knew what colours she uses in her branding and I knew her to be a fun person. We also brainstormed ideas for the ezine name and tagline and this process also gave me indications of what the client would like. This process can be used for anything you outsource. Communicate what you want very clearly, with examples if possible and include what you don’t like or want. Also be open to suggestions from your team, they have experience and probably know what will and won’t work. 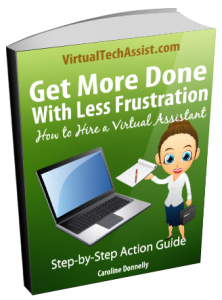 Good communication will help your virtual assistant work faster and better, and you’ll both be happy with the results. If you would like an ezine template designed, click here to contact me.